JNN 08 Aug 2014 Riyadh : The head of the transportation committee at the Makkah Chamber of Commerce and Industry said this year’s Umrah season has provided a $1.6 billion boost to the local economy. Saad Al-Qurashi told Al-Watan daily that this figure includes accommodation, transport and food services. “The average Umrah visitor spends about $270 and Umrah pilgrims visiting Makkah spent at total of more than $1.6 billion, which allowed for a very profitable Umrah season,” he said. He pointed out this year’s Umrah season was very good and complaints have significantly declined from last year. He noted five-star hotels in Makkah central area reported 100 percent occupancy rates, while accommodation around the central area had an average 60 percent occupancy rate. “Umrah companies have become very experienced and can manage to avoid losses and deal with any obstacles they may face,” he said. 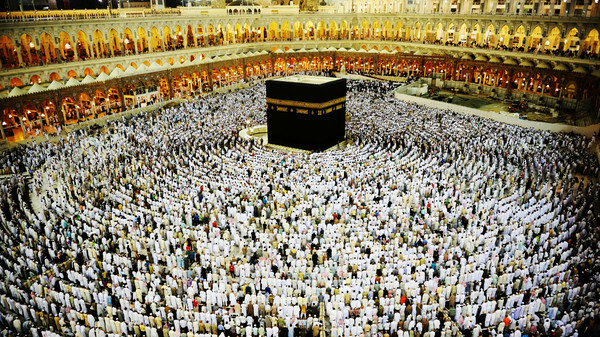 While this is only the amount earned During a Single Season of the Umrah Pilgrimage , while the HaJ Pilgrimage is much Bigger Event , and thus generates Multiple of these amounts , But None of these Incomes are Used for the Betterment of the Citizens of the Holy Land , while these Revenue are Used on the Luxuries and the Immoral Activities of the Royal Saudi Family , and in Sponsorship of the Terrorism , and Defamation of Islam . It should be noted here that the Major Amount of Revenue earned By Saudi Rulers comes from its Natural Resource which includes Petroleum Products , and secondly from the Tourism Industry , which is due to the Pilgrimage of the Most holy Places of Makkah and Medina . So there is no Second thought over the Flow of Huge Amount of Revenue Earned by the Saudi Ruler is God’s Blessing and Not in any Manner Result of any type of Labour Done by these Rulers. The All Mighty Allah has awarded the wealth for the Betterment of the Common People of Arabia , But Unfortunately and Regrettably the House of Saud is Usurper of the Wealth of the People of Arabia , As they have Looted the wealth of the Common People of Arabia , as till today atleast 50% of the Saudi Arabia’s Population , Below the Poverty Line , and Have No Means of Living , while Only the Family and Friends Circle of the Ale Saud enjoys Luxurious and Lavish Life Style , which accounts Less than 2% of the Population of Arabia. And the Same Ale Saud even Use the Money earned by the Holy Pilgrimage of the Muslims of the World , for Their Immoral Activities , for which they are Know World Over , and at the same time , Who Like to be called the Custodians of the Harmain Sharifain . Who have gone to the Depths of Evil as they even Use the same Money , for creating Sectarianism in the Muslims and sponsoring Terrorism in its Worst form , While the focus of such terrorism is also in the Muslim Countries to create Unrest and Chaos , in the Name of Islam . These Saudi Rulers are the Agents of the Zionists , as they have even Proved so many times , and especially in the recent Massacre of the Palestinians , by the Zionist Entity of Israel in its 29 Days of Wild Bombardment on the Innocent Civilians , these Saudi Rulers or the Mercenaries Army could not even tried to even throw a stone against the Zionist Forces , as these Saudi Rulers and their created Mercenaries are in good terms with the Zionist forces , and are actually working on their given agenda of creating Chaos and Uncertainty in the Muslim World. Rather support the Zionist Regime in their Plan of Greater Israel . This entry was posted in Middle East and tagged Ale Saud, Immoral Activities, luxury paris hotel, Makkah, Saudi Arabia, saudi royal family, Saudi Rulers, Umrah. Bookmark the permalink.